In order to make case taking an enjoyable experience we introduce robin Murphy's case analysis and prescribing techniques. Topics such as the organon, mistake in prescribing, vital force, definition of health, etiologies, case management and miasm. Point wise approach to case taking with discussion on related subjects. He also points out the common mistakes student or practitioner may make in the course of case taking or treatment. Dr. Robin Murphy was born on August 15,1950 in Grand Rapids, Michigan. He carried out his undergraduate studies at the Michigan State University. 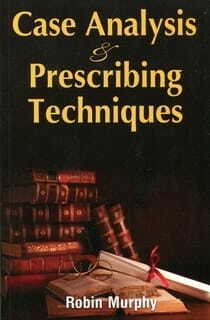 There he discovered their homeopathic historical collection and became intrigued with the system and began his studies. In 1976 he entered the National College of Naturopathic Medicine. And he was awarded for his thesis. He also taught at Bastyr University. His two previous books, Medical repertory and Lotus Material Medica were extremely popular. He is presently the director of Lotus Medical Center. Murphy was one of the earliest seminar teachers and is responsible for introducing many people to homeopathy.